Spending time at trade shows is a great way to gain business, but the travel and shipping associated with trade shows can be a strain on the environment. Fortunately, there are ways to ship and travel green. Traveling and shipping green to your trade show not only helps the environment, but can also lower your trade show costs. Shipping to your trade show can be made more green by choosing green shipping methods, switching to more eco-friendly shipping materials and choosing lighter weight materials to use in your trade show display. Research different carriers to find out which carriers have made efforts to make the shipping process more environmentally sound. The United States Postal Service (USPS) has been experimenting with the use of electric vehicles for over a century, making them a perfect choice in green carriers. Currently, alternative energy vehicles account for approximately 20 percent of the USPS fleet of vehicles. United Parcel Service (UPS) also maintains a fleet of alternative energy vehicles. In addition to this fleet, UPS is constantly examining the routes used by their delivery drivers to establish more efficient routes that would require less fuel. Another way to go green via shipping method is by sending items in bulk if necessary. For example, if your company is doing several trade shows in the same area, you can send all of your equipment and goods for the combined trade shows in one shipment. This allows the carrier to only deal with one delivery, and it is likely that you will be using less packaging for a bulk shipment rather than individual shipments. Whether you decide to use the shipping materials available through a carrier or you go to an office supply store to purchase these materials, you can find shipping materials that are made with the environment in mind. The first step to switching to green shipping materials is making sure that the materials you choose are recyclable. This is generally the case with shipping materials made of cardboard, but you will want to check on the packaging just to be certain. Many companies offer packaging that is made from previously recycled materials. Before you purchase packaging made from recycled materials, make sure that it is durable enough to withstand the shipping process. Examine the thickness of the cardboard and see if there is any information about how much weight the packaging can support. Durable shipping materials have the added green attribute of being able to be reused. If you need to ship items back to your office from the trade show, you can use the same packaging that you used to ship items to the show. When you choose the materials that you will be using in your trade show display, keep in mind that heavier items will cost more money to ship and will have a bigger negative impact on the environment. As with shipping materials, you can also choose display materials that have been recycled or are recyclable and make an effort to reuse your displays as many times as possible. Traveling to your trade show also puts a strain on the environment, but there are ways you can help offset this strain. If you are traveling and leaving an empty home behind you, you can start making your travels green before you even begin your journey. Appliances that are left plugged in while not in use still draw a small amount of energy, so be sure to unplug everything before you walk out the door. You can also either turn your thermostat off or adjust the temperature to save energy, depending on the weather outside. Hot water is not a necessity while you are away from home, so adjust the thermostat on your hot water heater to avoid wasted energy used to heat your water. Pack as light as possible to avoid adding to the energy necessary to transport and screen your luggage. This also saves you time and money if you are traveling by air, as you will not need to wait in line and pay a fee to check a bag. To cut down on plastic waste, take a refillable plastic bottle with you on your journey. While you cannot take liquids through security if you are traveling by air, you can take an empty bottle with you. To take your green traveling initiative one step further, take small, reusable bottles of toiletries and request that your hotel not provide you with their disposable bottles of toiletries. If the trade show is reasonably close to your business, car travel is the most environmentally friendly way to travel. However, longer distances make this mode of travel unreasonable. When you are traveling to a trade show that is far away, consider train travel. 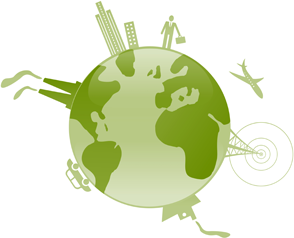 It is more environmentally friendly that air travel, although it may be too time consuming or cost prohibitive. If you absolutely must travel by air, research airlines that allow you to purchase carbon offsets. These offsets are often available with the purchase of your ticket and are specifically intended to offset the carbon expended by your specific trip. Choosing a hotel that is close enough to your trade show that you can get there on foot is the best choice. This allows you to avoid both the cost and fuel waste of a taxi or bus ride and can likely save you time. Traveling and shipping green to your trade show can help the environment and allow you to save money. Before your next trade show, do a little research about the companies you are using for your shipping and traveling needs to be sure that they are employing environmentally friendly methods. Not only will you feel good about doing your part for the environment, but you will save money through recycling and reusing.